As part of today's announcement, Google revealed the new Google Clips, a tiny camera equipped with Moment IQ machine learning meant to capture "motion photos," from "unique perspectives." It automatically chooses which moments to record. I'm at a bit of a loss to determine a use-case for it, though. The so-called "motion photos" are a fancy term for short video without audio, so it sort of sounds like an automatic GoPro, but without the added benefit of audio. Unlike a GoPro, though, it is able to recognize familiar faces and pets via something called Moment IQ, recording content automatically while they're in frame. Moment IQ is powered by Intel's Movidius VPU, which provides low-power machine learning solutions for video processing, keeping things on device and, presumably, in your control. 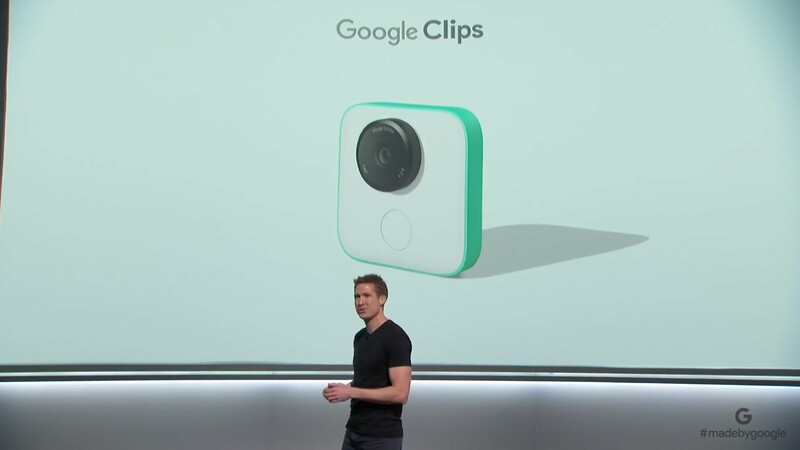 Google Clips has a wide 120-degree FoV and weighs just 60.5 grams, recording at 15FPS to the built-in 16GB of storage, with 3 hours of "smart capture" battery life. It even uses Wi-Fi Direct to transfer recorded media to your phone. Frankly, I'm not quite sure what this is for. Apart from the machine learning to hit record for you, it doesn't seem very useful. It can't record video at a decent frame rate, doesn't have a mic, and doesn't appear to have any water resistance, making it worse than a GoPro in pretty much every way, excluding the smart motion-capturing. The use cases shown included leaving $250 cameras strewn about your floor and living surfaces, which seems like a cross between paranoia and a really expensive mistake. I guess for parents that leave their kids unattended for long periods of time that simultaneously fear missing out on cute moments it could come in handy, but that's a really narrow use case. Personally, when your feature list includes things like "it has a shutter button" and "stands on its own" I don't have a lot of hope for it. I'm also concerned about some of the privacy implications of it as well as nefarious use cases. For more info check out Google's blog post on the subject. The Google Clips isn't yet available for sale, but you can join the waitlist on the Google Store.